Talk about easy - pop it into the microwave and voila, it's dinner. And even better - clean-up it a snap! 1. In a small bowl, combine the orange peel and juice, soy sauce, hoisin sauce, ginger and sesame oil. Mix to blend and set aside. Place the spinach in a mound to cover 2/3 of a microwaveable dish. Drizzle and toss with 2 tsp of the water. 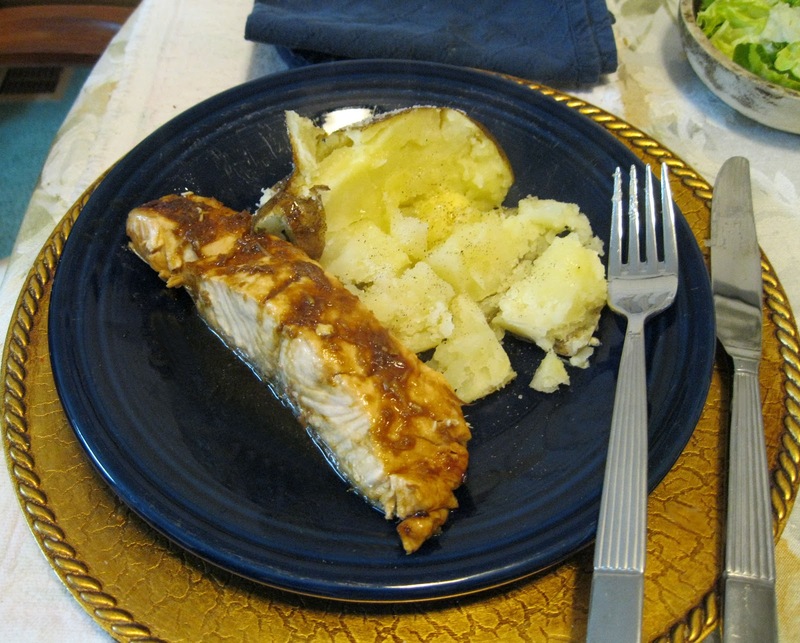 Place the salmon fillets on top. On the other side f the dish, toss the snap peas, carrots, 1 Tblspn of the soy mixture, and the remaining 3 tsp water. 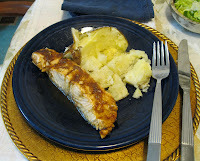 Drizzle 2 Tblspn of the soy mixture over the salmon. 2. 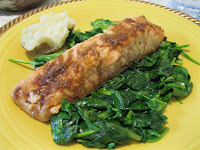 Cover with vented plastic wrap (keep wrap about 1" above food), and microwave on high power for 5 to 7 minutes, or until the salmon is slightly opaque in the center and the vegetables are tender. Drizzle the remaining soy mixture over the salmon and vegetables. Sprinkle with the scallions. Ok, just let me say that I don't spend the time doing the veggies. I do the spinach and usually have a salad with the meal. I use orange juice from the carton and never what equals juice from 1/2 orange. Fruit juices definitely have to be used in moderation since they are extremely high in sugar, albeit natural, but still is sugar. I have yet to make this recipe and have hoisin sauce - someday. Between the two salmon recipes (Glazed Mustard Salmon) and this one, this one wins hands down if you don't want to mess with more than one baking dish to clean up. On the flip-side, it all depends on what your taste buds are in the mood for.